The best milking goats generally come from the dairy breeds averaging 1,800 to 2,200 pounds of milk during the lactating season. These goat breeds originated in different parts of the world, including Africa, the Alps and even the United States. Most dairy breeds are large or standard-size, but one is a dwarf. Alpines originated in the French Alps and came to the U.S. in the 1920s. These goats produce a great deal of milk, averaging almost 2,400 pounds in a year, according to the American Dairy Goat Association. They're a medium breed with erect ears, weighing around 135 pounds and standing 30 inches at the shoulder. They can be almost any color except pure white and the Toggenburg light brown with white markings. 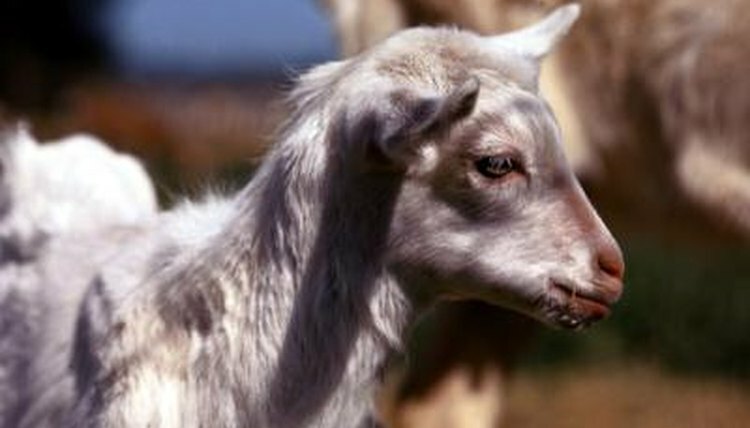 LaManchas originated in Oregon as a cross between dairy goats and Nubians. These goats produce nearly as much in a year as Alpines. They're a small breed with tiny ears less than 2 inches in length. They weigh around 130 pounds and stand 28 inches at the shoulder. They can be any color. Nigerian dwarfs, originating in West Africa, are the smallest of the dairy breeds. These goats average more than 700 pounds of milk a year, according to the American Dairy Goat Association. They're a small breed that look like their bigger dairy counterparts. They weigh around 75 pounds and stand less than 23 inches at the shoulder. They can be any color, and some have blue eyes. Nubians originated by crossing English goats with Indiana goats and African goats. These goats vary in their milk production, averaging about 1,800 pounds yearly, according to the American Dairy Goat Association. They're a large breed with long dropped ears, weighing around 135 pounds and standing 30 inches at the shoulder. They can be any color. Oberhaslis originated in Switzerland. These goats are good milk producers: they average about 2,250 pounds a year, according to the American Dairy Goat Association. They're a small to medium breed, weighing around 120 pounds and standing 28 inches at the shoulder. Their color is very specific. They are a bay color called chamois with a black face, dorsal stripe, legs, belly and udders. Females can be all black. Milk from Oberhaslis has a distinctive taste that some people don't like. Saanens and Sables originated in Switzerland. These goats average about 2,500 pounds of milk a year, according to the American Dairy Goat Association. They're a large breed with erect ears, weighing around 135 pounds and standing 30 inches at the shoulder. Saanens are white or cream; Sables are any other color. Toggenburgs originated in the Swiss Alps. These goats average about 2,000 pounds of milk a year, according to the American Dairy Goat Association. They're a small breed with erect ears, weighing around 120 pounds and standing 26 inches at the shoulder. Toggenburgs have brown bodies from dark chocolate to fawn with white lines on the sides of their heads over their eyes. They have white lower legs, white ears and white on either side of their tails. Milk from Toggenburgs can taste distinctive and many people don't like the flavor.